The Southern live oaks that line the Gulf Coast have weathered multiple hurricanes. Hurricane Katrina, which made landfall on the coast on August 29, 2005, was the worst storm to hit Mississippi since 1969’s Hurricane Camille. For Mississippians returning after Katrina to find their homes damaged or destroyed, the battered condition of the live oaks was a psychological blow. Hardy as they are, the oaks had been subjected to severe stress. Prolonged saltwater inundation had poisoned their roots and high winds and debris had damaged their branches. A September 8, 2005 National Public Radio segment captured the uncertainty about the fate of many ailing live oaks, uncertainty that would last for months and even years. And yet, many of the live oaks survived. 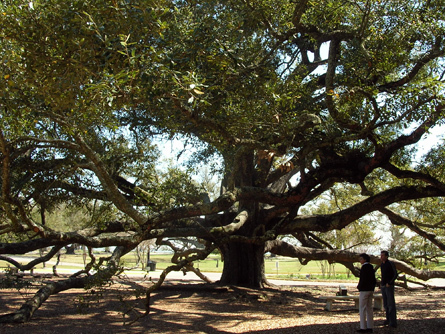 Shelia White of the University of Southern Mississippi writes of her joy upon discovering that the Friendship Oak, a fixture of the university’s Gulf Park campus, had endured through Katrina. At over 500 years old, the Friendship Oak has given shade and shelter to generations of students and faculty at USM. Most of the surviving oaks have made a full recovery: their foliage is green year-round, they are hung with Spanish moss, and their sturdy branches are beginning to grow once again. For the Gulf Coast community, these great oaks have come to symbolize the coast’s survival and slow but steady recovery after Hurricane Katrina. Previous: The live oak in Southern cities and culture. long live this oak if this oak born in bangladesh then our country will save.